We've changed the film's Facebook, Twitter and website address (full site pending) to all match: it's now Ebert Movie all the way! 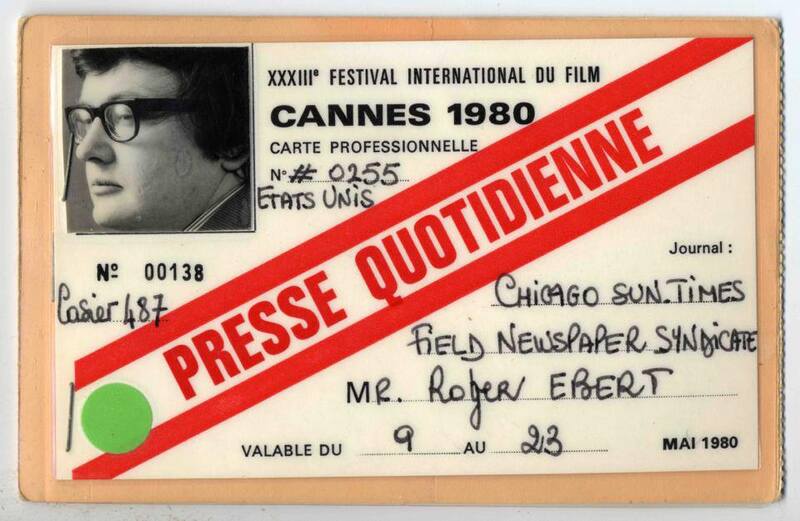 We celebrated by putting out a new image, that of Roger's 1980 Cannes press pass. We feel that Roger would have approved. A great archival find sparked a very popular Tumblr post and many tweets yesterday. Life Itself producer Zak Piper found a blog post by Ian Schoenherr in which Ian had posted a 1957 letter to the editor of Amaazing Stories by a 14-year-old Roger Ebert. The wonderful letter reveals Ebert's writing style to be almost fully formed at such a young age, as was his interest in criticism as an artform: "I just simply get a kick out of finding someone else's opinion on a book I've read," he writes. Matt Singer picked up on the find at IndieWIRE, writing "Ebert was already more interested in criticism as a conversation starter, rather than a passage of judgement. That's fascinating." Today we had a spike of new Twitter followers thanks to the influential film critic Scott E. Weinberg, who really, really, really, went to bat for the film, inspiring a number of supportive and excited tweets. Thanks Scott! Perhaps most excitingly of all we partnered with Sundance Film Festival to allow donors to their new Roger Ebert Scholarship in Film Criticism an exclusive sneak peek of our upcoming “Life Itself” before anyone else. You can see it if you support the scholarship here: http://bit.ly/EbertScholars. All this is just the beginning! Expect some big things to come next month! We're grateful to see so many fans pledge their support already. The film is currently finishing final interviews and being edited by Steve James.